This processed image provides the best view yet of the enormous 290-kilometer (180-mile) high plume from the volcano Tvashtar, in the 11 o'clock direction near Io's north pole. 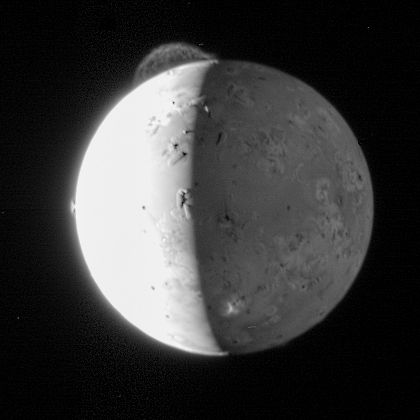 The plume was first seen by the Hubble Space Telescope two weeks ago and then by New Horizons on February 26; this image is clearer than the February 26 image because Io was closer to the spacecraft, the plume was more backlit by the Sun, and a longer exposure time (75 milliseconds versus 20 milliseconds) was used. Io's dayside was deliberately overexposed in this picture to image the faint plumes, and the long exposure also provided an excellent view of Io's night side, illuminated by Jupiter. The remarkable filamentary structure in the Tvashtar plume is similar to details glimpsed faintly in 1979 Voyager images of a similar plume produced by Io's volcano Pele. However, no previous image by any spacecraft has shown these mysterious structures so clearly. The image also shows the much smaller symmetrical fountain of the plume, about 60 kilometers (or 40 miles) high, from the Prometheus volcano in the 9 o'clock direction. The top of a third volcanic plume, from the volcano Masubi, erupts high enough to catch the setting Sun on the night side near the bottom of the image, appearing as an irregular bright patch against Io's Jupiter-lit surface. Several Everest-sized mountains are highlighted by the setting Sun along the terminator, the line between day and night. This is the last of a handful of LORRI images that New Horizons is sending "home" during its busy close encounter with Jupiter - hundreds of images and other data are being taken and stored onboard. The rest of the images will be returned to Earth over the coming weeks and months as the spacecraft speeds along to Pluto.